The good news is three subjects who received the implants have regained a semblance of eyesight, albeit reduced to a dull monochrome. 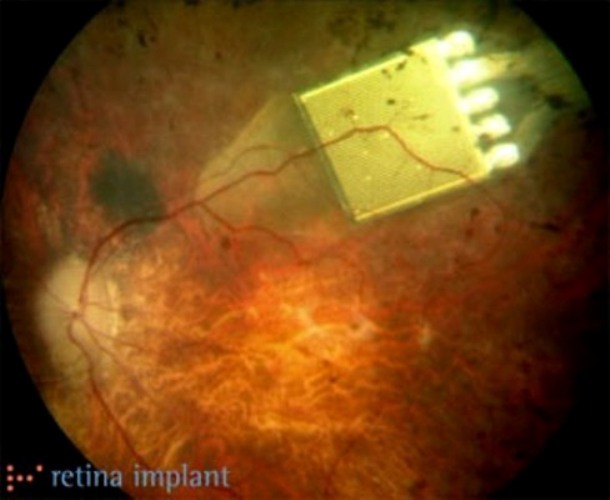 This recent breakthrough is the work of Retina Implant AG, a gathering of international medical talent and research based in Reutlingen, Germany. The awesome gizmo they’ve conceived is a tiny 3mm subretinal chip containing 1500 microphotodiodes. These send pulses to the brain that generate a 38 x 40 pixel grid. The hard science behind this miniscule piece of miracle tech is the microchip containing the above mentioned microphotodiodes. Each microphotodiode has photocells plus an amplifying circuit and a stimulation electrode. It works this way: the photocell absorbs the light, triggering the electrodes that transmit to the visual cortex. Being newly developed technology, a separate power source is still needed, thus explaining the tiny power line extending to the back of the subject’s ear. Just to round out the explanation on how this works, the amount of light received by the photocells determines the current of the electrodes, which stimulate retinal cells leading to visual sensations. Due to the freshness of its testing however, there’s little chance the lucky once-blind subjects will be seeing in technicolor until the next great breakthrough.